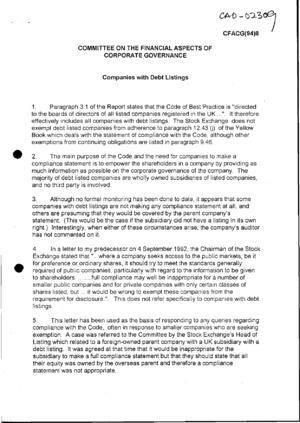 Cambridge Judge Business School : The Cadbury Archive : Companies with debt listings, 30 November 1994. Companies with debt listings, 30 November 1994. The paper seeks to establish whether clarification or exemption is required on Paragraph 3.1 statement of compliance about debt-listed companies.